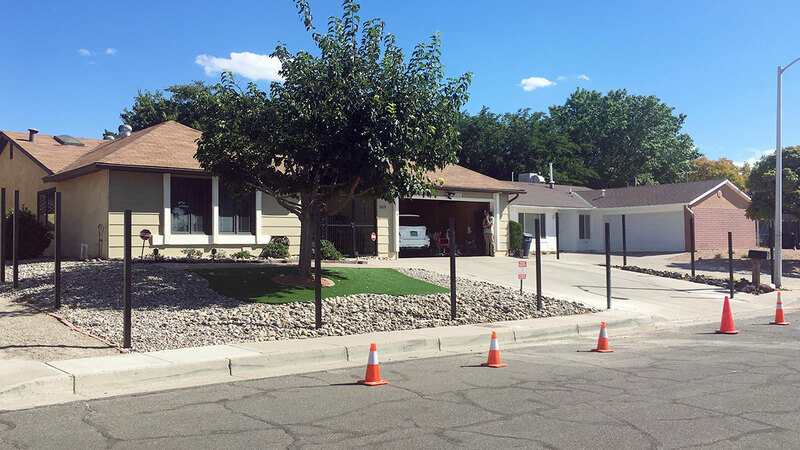 The real Albuquerque house made famous by the methamphetamine-making character Walter White in the AMC-TV hit series "Breaking Bad" is getting a fence. ALBUQUERQUE, N.M. -- The real Albuquerque house made famous by the methamphetamine-making character Walter White in the AMC-TV hit series "Breaking Bad" is getting a fence. Some tourists have even told them "to close our garage" and "get out of the picture," Quintana said. On Friday, a worker was seen placing poles and two women in chairs outside of the house's open garage yelled at visitors trying to take photos. One woman shouted expletives at an Associated Press reporter snapping images of the house and demanded the reporter stay away from property. "Breaking Bad" follows Walter White, played by Cranston, producing and selling methamphetamine with a former student, Jesse Pinkman, played by Aaron Paul. The show ended in 2013, but tourism companies in Albuquerque still embrace the drug-addled series and give "Breaking Bad" tours showcasing spots made popular in the show. The Albuquerque Convention & Visitors Bureau created a website of the show's most popular places around town to help tourists navigate. The Walter White house is not listed. however. Still, a number of fan sites give the address and photos of the house are posted on Instagram almost every day. A prequel to the show, "Better Call Saul," is filming its fourth season and recently shot scenes near the Albuquerque bureau of The Associated Press.